Dish Food & Events caters and plans beautifully executed corporate and social events in New York City, The Hamptons and beyond. Based in Williamsburg Brooklyn, Dish serves seasonally inspired, contemporary food with global influences. 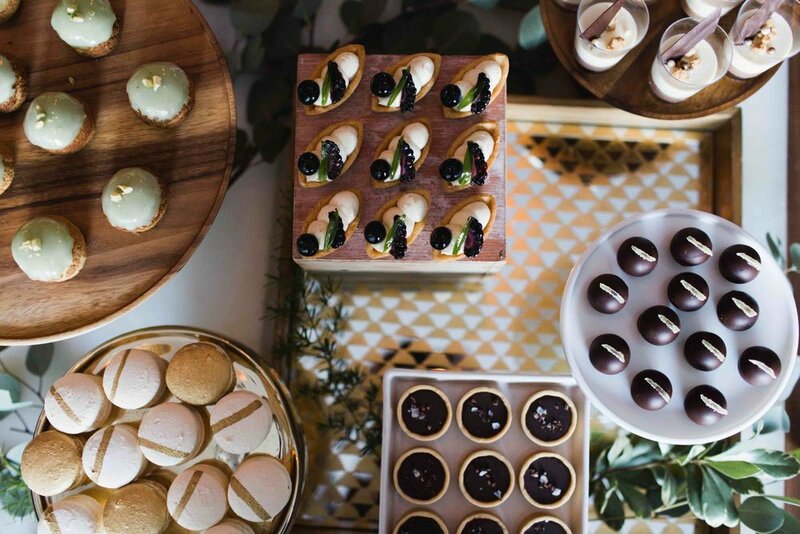 From intimate cocktail and dinner parties to elegant weddings and fundraisers, Dish creates events where simplicity, innovation, and warm hospitality are reflected at every step. When Dish launched in 2007 (during the recession! ), we were catering mostly small budget friendly events around Brooklyn and NYC. As we grew over the next few years and became more visible, couples started reaching out to talk to us about catering their weddings. The rest is history! Catering weddings felt very rewarding and we just loved the connections we made with couples. Some of those original couples are still our good friends today. What’s your favorite thing about working in the industry? What’s the most challenging? Our favorite thing is that we get to create one-of-a-kind, unique experiences for our clients. No two events are the same. That’s probably the most challenging part of our job, too, but it’s something we enjoy living up to every time. Favorite thing about catering an event at the Green Building? We are inspired by everything around us and we try to keep an open mind when developing our menus. We are inspired by our clients and their own heritage or foods they love. We are inspired by travel and the tastes we experience around the world. We are inspired by the restaurants we dine at and we are inspired by our industry friends not to mention other caterers all over the country. One of our most popular hors d’oeuvres is our vegan stuffed cucumber. It’s delicious, fresh and crunchy which makes it an amazing compliment to some of our richer bites. It’s also gluten-free and vegan so it satisfies a lot of our guests with dietary restrictions. Our clients constantly rave about our wine braised short ribs. It’s the perfect dish to serve at Fall wedding and can offer plated, family style or on a buffet. How would you describe the food your company serves? New American with global inspiration. What are some of the food & beverage trends you're predicting in 2019? What do you do to stay current on trends? We are seeing more requests for fusion style menus. Wedding clients want to combine one or two food cultures and have that represented at cocktail hour, dinner or both. Types of menus range from a mediterranean feast featuring whole roasted Branzino to a Chinese fusion menu served on a lazy susan. To stay up to date on trends, we are constantly meeting with industry insiders and browsing event related blogs and websites. We also attend trade shows and catering conferences during year to share ideas, network and connect with fellow event planners and caterer. We think it’s really important for clients to understand what the experience will be like working with their caterer. So they should really dig in and make their caterers talk them through the process from menu creation to tasting the food to rentals selection and of course to the Big Day! Couples should also first make sure that their caterer is familiar with the venue they are getting married at. A caterer that works at a venue often knows all the ins and outs and can better anticipate needs throughout the event planning process. Any tips for couples on how to develop a wedding menu? We encourage our wedding couples to really plan a menu based on their own tastes and favorite foods. It’s your wedding and the food should be an expression of you as a couple. Don’t worry too much about pleasing every single guest. It’s your caterers job to really present a menu with enough options that every guest will have a unique and enjoyable experience. If you had one weekend to travel anywhere, which city would you dine in? Bangkok. We are both dying to go back for more Thai Indian food! How does living and working in Brooklyn affect you as a chef? Living and working in Brooklyn is inspiring because we are surrounded by so many great chefs and top talent. Living in such a diverse community presents inspiration and ideas around every corner, from the homemade tamales greeting us on the way to the train to dim sum in Sunset Park. What do you listen to when you're cooking? At the Dish kitchen since everyone's tastes are a little different, our cooks are required to share the air time on the sound system throughout the day. Step into our kitchen and you are probably going to either hear Top 40, Classic Rock, R&B or Hip Hop. If you are in Ryan’s home kitchen, you are likely to hear a bit of pop/dance or upbeat show tune-y Liza Minnelli and Judy Garland songs. Betty: Gin Martinis with Cornichons! Favorite spot to dine in Gowanus? Ryan: A Cuban Sandwich from My Cuban Spot puts the best Miami cuban joints to shame. Sorry Miami! Go Gowanus! Ryan is out in East Hampton working in his organic vegetable and flower gardens. Betty is probably hanging out in Prospect Park with her daughter, Aurora. A year after she was married, Betty went on a bike trip through Germany, France, and Spain with her husband. Riding through Chateauneuf de Pape, they stopped at a well renowned winery, Domaine de la Solitude. The owner of the winery was so enthused with their interest in the wine (and the fact that they biked over a very bumpy, unpaved road to get there!) that he gave them an extra bottle of their prized red to take “for lunch.” Betty and her husband enjoyed the wine that evening with some local goat cheese and fresh wood-fired bread at their campsite that night. The tastes were incredible! Ryan lists dining at Thomas Keller’s Per Se as one of the best restaurant experiences of his life. It was life changing in that every aspect of the meal was pure perfection in food, wine and hospitality. I carry moments from that meal with me in my professional life in hospitality and catering.